Online Prediction Framework (OPF) is a framework for working with and deriving predictions from online learning algorithms, including HTM. OPF is designed to work in conjunction with a larger architecture, as well as in a standalone mode (i.e. directly from the command line). It is also designed such that new model algorithms and functionalities can be added with minimal code changes. Encoders turn raw values into sparse distributed representations (SDRs). A good encoder will capture the semantics of the data type in the SDR using overlapping bits for semantically similar values. Models take sequences of SDRs and make predictions. The CLA is implemented as an OPF model. Metrics take input values and predictions and output scalar representations of the quality of the predictions. Different metrics are suitable for different problems. Clients take input data and feed it through encoders, models, and metrics and store or report the resulting predictions or metric results. Each of these 3 components is in a separate set of modules. Metrics and writing output are optional when running models. The OPF does not run models automatically. All the models in the OPF operate under a “push” model. The client is responsible for getting records from some data source, feeding records into the model, and handling the output of models. Constructor for the model. Must take a modelDescription dictionary, which contains all the parameters necessary to instantiate the model, and an InferenceType value (see below). A model’s __init__() method should always call the __init__() method of the superclass. Returns: The logging object for this class. This is used so that that the operations in the superclass use the same logger object. 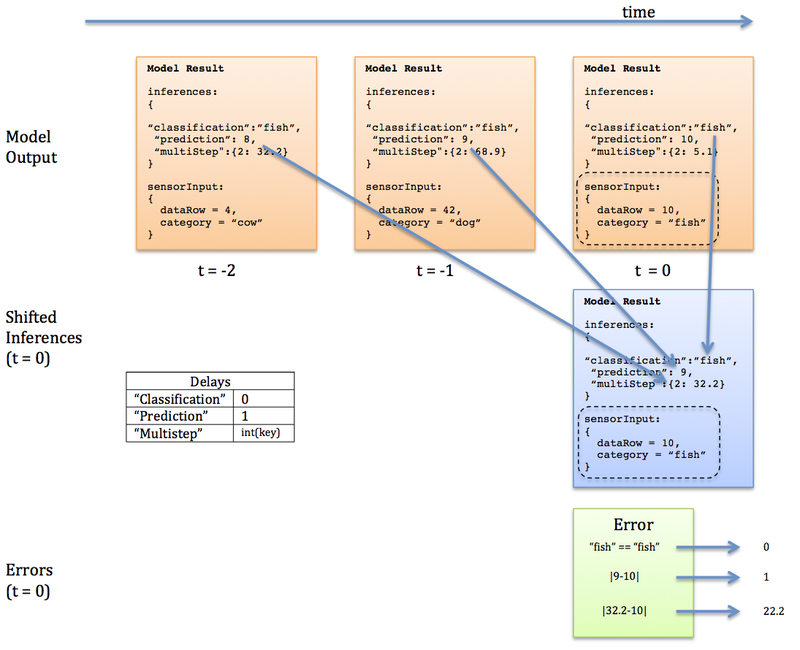 Enables/Disables inference output for this model. Enabling inference takes an optional argument inferenceArgs, which is a dictionary with extra parameters that affect how inference is performed. For instance, an anomaly detection model may have a boolean parameter “doPrediction”, which toggles whether or not a prediction is computed in addition to the anomaly score. The inference state of a model can be queried internally and externally using the isInferenceEnabled() method. The inference arguments can be queried using the getInferenceArgs() method. Save the model state via pickle and saves the resulting object in the saveModelDir directory. If there is state that cannot be pickled and needs to be saved separately, this can be done by overriding these methods (implemented as no-ops by default). Figure 2: Records are input to models in the form of dictionary-like objects, where the keys are field names and the values are the raw field values. Certain field types need to be converted into primitive input types. For example, datetime types are converted to 2 integer values, timeOfDay and dayOfWeek. In the OPF, this process is called translation. Generally, all models will have a translation step. Conceptually, translation produces two parallel lists (for performance reasons): A list of field metadata, and a list of translated field values. In practice, the first list is constant, so it can be pre-computed and stored in the model. This is the return value of getFieldInfo(). Additionally, for some model types (such as the CLA model), the translated inputs are quantized (put into buckets) and converted into binary vector representation. This process is called encoding and is handled by encoders (specific encoders for different data types exist). Most models may not need to encode the input (or, more likely, they will just need to quantize the input). The ModelResult object is the main data container in the OPF. 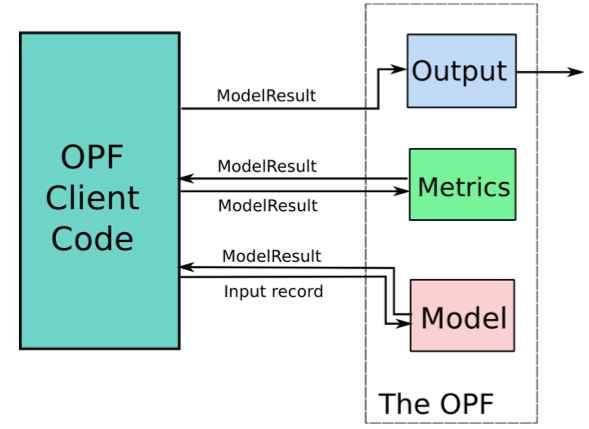 When a record is fed to a model, it instantiates a new ModelResult instance, which contains model input and inferences, and is shuttled around to the various OPF modules. Below is a description of each of the ModelResult attributes. They default to None when the ModelResult is instantiated, and must be populated by the Model object. rawInput: This is the exact record that is fed into the model. It is a dictionary-like object where the keys are the input field names, and the values are input values of the fields. All the input values maintain their original types. metrics: A dictionary where the keys are the unique metric labels, and the values are the metric values (a single float). This is the only element that is not populated by the model object, but by the surrounding code. As explained above, fields from the raw input are translated into primitive input types. There also may be additional information about the input record that is needed by the OPF framework. The SensorInput object is a container that stores translated input record, as well as auxiliary information about the input. More attributes may be added to the SensorInput object as new features require them. Note: not every model needs to populate every field in SensorInput, and the exact requirements depend on which inferences and metrics are being computed. sequenceReset: Control field for temporal patterns. This field has a value of 1 if an explicit temporal reset was specified for this record, 0 otherwise. Resets are currently not being used. dataRow: The translated version of the input row. dataEncodings: The encoded version of the input, used by some metrics. This is a list of binary numpy arrays, one for each field in dataRow. category: In classification problems, this is the class label for the input record. The concept of InferenceElements is a key part of the OPF. A model’s inference may have multiple parts to it. For example, a model may output both a prediction and an anomaly score. Models output their set of inferences as a dictionary that is keyed by the enumerated type InferenceElement. Each entry in an inference dictionary is considered a separate inference element, and is handled independently by the OPF. Data structures related to inference elements are located in opf_utils.py. For reasons unknown and poorly explained, the OPF handles different data types for inferences differently. This helps with the automation of handling new inference types, but can be confusing. In this example, we can see that the “prediction” inference element is associated with SensorInput.dataRow, and the “classification” inference element is associated with SensorInput.category. When a new inference element is added, an entry needs to be added in this map to connect it with input. Because OPF Models make predictions about the future, the OPF needs to line up inferences with their respective ground truth values so that it can compute metrics and write results appropriately. For example, InferenceElement.prediction is a prediction about the next record. In order to compute error metrics, this inference needs to be shifted one record forward in time to be compared with its corresponding ground-truth record. The InferenceElement class defines the getTemporalDelay() method, which specifies how much a given inference element needs to be shifted in time. For dictionaries, an optional key argument is supplied, each entry in the dictionary can be shifted by a different amount. This shifting applies to both csv output and metrics calculation. Each inference element in a ModelResult is shifted independently of the other inference elements, so you can have inferences about multiple points in the future all contained in a single ModelResult. This means that we are calculating the average absolute error (“aae”) on the multiStepBest inference element, for the entry that corresponds to the field “foo”, and with an optional parameter “window” set to 200. The modules that actually calculate metrics are located in metrics.py. They all inherit the abstact base class Metric, and they must define the following methods. addInstance( prediction, groundTruth, record): This is the method where a new inference-groundTruth pair is passed to the metric. Additionally, the raw input record is also passed to the metric calculator. The module is responsible for calculating the metric and storing the relevant information here. Types: Different inference value types are handled differently. The OPF distinguishes between 3 types: lists, dicts, and other. Lists are assumed to be associated with the model’s getFieldInfo() output. An individual element is always output as a string, no matter it’s actual type. Dicts are the most general, and separate columns are created for each key. Each entry in a dictionary is output as a string, no matter its type.